Flexible Lifeline Systems provides annual inspections of fall protection equipment to ensure compliance with OSHA 1910/1926 and ANSI Z359. Typically, we work with organizations who want reassurance that their fall protection equipment is being inspected by professionals who know what they’re doing. If you want to remove the hassle of managing and manually documenting your own inspection program, then our services can help. By having your annual inspection performed by one of our trained professionals, you’ll have the security of knowing these safety concerns are not being forgotten, overlooked, or done improperly. All inspection programs are be managed by one of our Field Service Advisors (FSA). The assigned FSA will work with you to develop an onsite inspection program that keeps you in compliance and meets your specific needs. Our Field Service Technicians (FST) are highly trained and experienced fall protection inspectors. Certified by most major manufacturers, our FSTs also undergo continuous training to be sure your equipment is inspected properly. 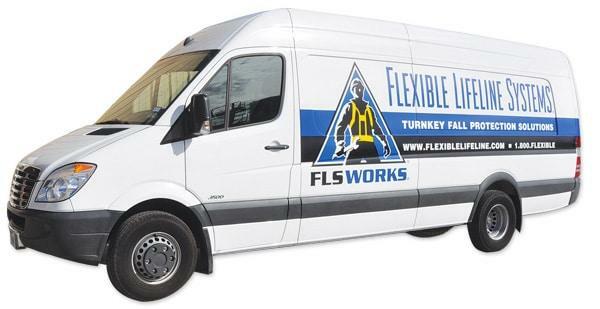 FLS utilizes the I-Safe inspection tracking and reporting system technology. RFID (radio frequency identification) tags are retrofitted to all inspected items and a handheld scanner allows the technician to digitally record the inspection process as it’s performed. The I-Safe program produces detailed inspection reports, which are then generated and provided to the customer upon completion. Historical data from previous inspections, pass/fail ratios, and other relevant information is stored and available at anytime upon request. FLS also offers 5 year engineering and design review services where one of our qualified engineers can review the original design of your system to ensure compliance with the latest regulatory requirements. Our inspection capabilities cover a wide range of safety solutions. Not only can we inspect your personal protective equipment (PPE) such as harnesses, lanyards, and retractable lifelines, we can also provide inspections for your lifeline systems, temporary and permanent ladders, work platforms, and many other solutions. If you’re tired of wasting time, energy and resources managing your fall protection inspection program, contact us today!